How do I share a class with my co-teacher? Click on Classes, and then click on Manage Classes and scroll to the bottom of the page to a section titled Invite Co-Teachers. Enter the email address of your co-teacher and select the classes to which you would like them to have access. Co-teachers will receive an email inviting them to co-teach. Once you invite a co-teacher, you will see a pending invitation under the My Co-Teachers section. To see what classes you co-teach, see the “Active classes” table under the same Manage Classes page. You will see your name under the Co-Teacher column. Note: If you are looking to be added to a class as a co-teacher, you must have the owner of the class complete the above steps to give you access to the class. How do I edit or remove a co-teacher? Click on Manage Classes then scroll down to the My Co-Teachers section. Click on Edit on the row of the co-teacher. You will be led to a page where you can either select or deselect which classes the co-teacher has access to, or you can remove the co-teacher entirely. 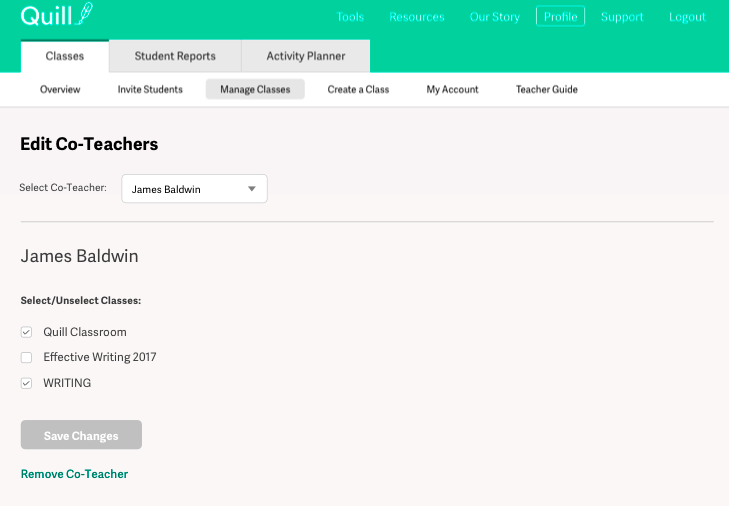 Manage classes and edit students. Assign activities to a class. Launch Quill Lessons with a class. Access diagnostic results and basic reporting. They cannot archive classes or activity packs – this must be done by the original teacher. They also cannot access Premium reporting unless they also have a Teacher Premium account.